In case you already don’t know, I am part of The Sunday’s With Joy Baking group on Facebook. Joy The Baker Cookbook is one of my very favorite cookbooks, just ask my friend’s, they will tell you that I rave about it all of the time. To quiet me up, they bought 6 copies for gifts, I guess they got the hint, BIG TIME! 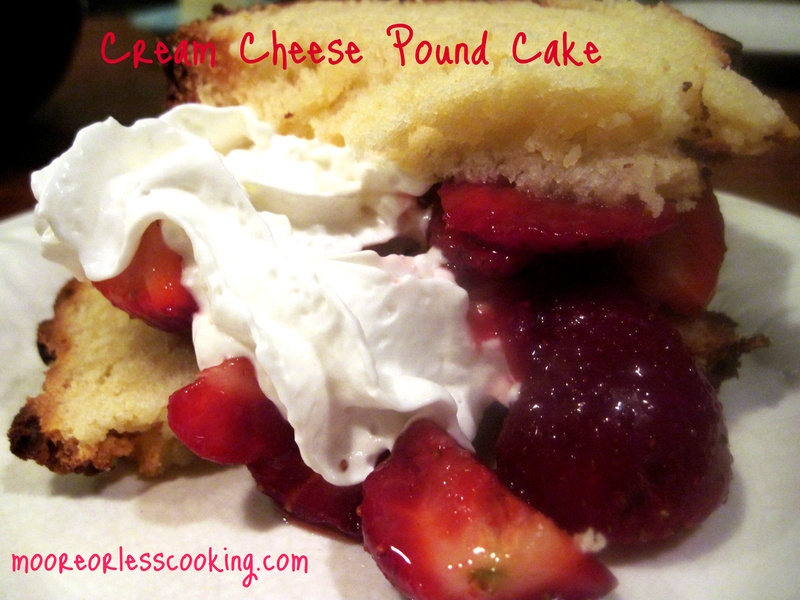 Today I am sharing with you, this delicious Cream Cheese Pound Cake. Pound Cakes are a wonderful, easy cake to bake when you need a quick delicious cake to eat plain or accompanied with fruit and cream. Besides making Tunnel Of Fudge Cake birthday Cake for hubs this month, which should have been named, “Tunnel Of Love Cake”, I also baked a Cream Cheese Pound Cake, because Strawberry Shortcake is his favorite dessert. Just add a tablespoon of sugar to a pint of sliced strawberries, let set in the refrigerator for about an hour before spooning over pound cake, with lovely juices, add a dollop of whipped cream. Everyone loves this dessert! Especially my hubby- dub- dubs! This is an amazingly moist pound cake, serve with fruit and whipped cream, or just eat it alone by the slice. Preheat oven at 325 F, with the oven rack in the center. Grease and flour a 9x5 inch loaf pan. In a medium bowl, whisk flour, baking powder and salt and set aside. Either in a stand mixer, or a large bowl with a hand mixer, beat cream cheese until soft. Add butter and sugar and beat until fluffy, for 3 minutes. Add the vanilla and stir until blended, then beat in the eggs one at a time, beating at medium for 1 minute each. With the mixer on low, slowly add in the flour mixture and beat until just incorporated. Stop mixer and fold together the batter with a spatula. Spoon into prepared pan and bake for 30 minutes. Bake for another 30-35 minutes until a toothpick inserted into the center comes out clean. Let the cake cool in the pan for 20 minutes, then transfer onto a wire rack to cool completely. 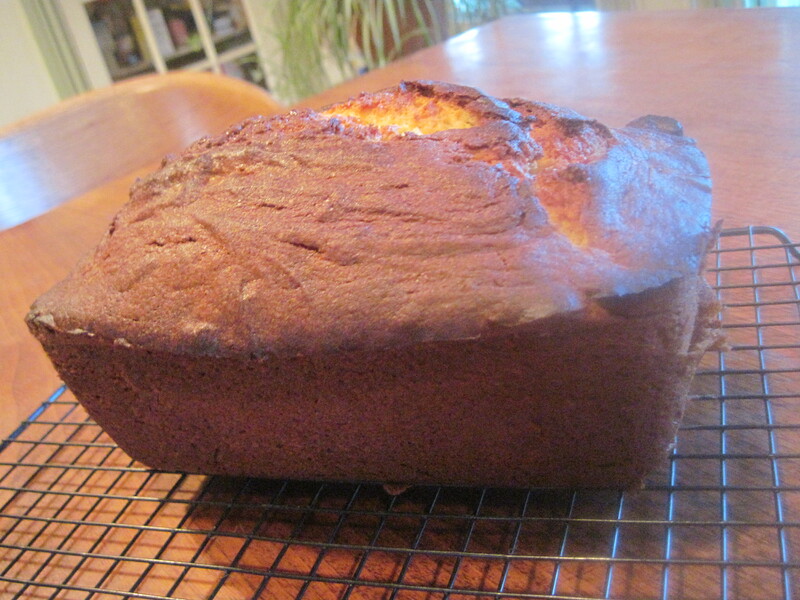 Pound Cake should last for up to 4 days at room temperature, well wrapped. I love a good pound cake! Thanks for sharing a wonderful recipe Nettie! I just made this cake and a lot of the cake overflowed I used a glass loaf dish is that what did it. I looked like I should have made 2 loafs? Do you have any answers. Thanks waiting for it to cool now. smells great! I need to make this. Immediately. As soon as I stop drooling. i absolutely love this cake! i’m so happy to see it representing strong! looks stellar! What is the difference between using salted or unsalted butter?? Does it really make a diference ???? That is a great question. In baking I use unsalted butter, usually there is added salt, this way there is a way to control how salty the recipe is. For cooking you can use either, just depending on whether there is a dietary limit of salt. Most people add salt to dishes that have already been cooked, according to their taste. I’m new @ your site, I love it Thanks. Can’t wait to try this. Nettie you are awesome! Looks delicious! Must try this. Wish you had sent a sample!! Thanks for sharing. hope you get a chance to try, one of my favorites. Making it right now 🙂 Smells divine!!!! I always heard that you do not pre-heat your oven with pound cake. Have you tried it that way? Have to try that method now that I have a new oven that I call Olivia, I know she will do an amazing job! What do you mean by “rotate the cake”? Depending upon your oven, you may need to rotate the cake pans on their racks to ensure even baking. Don’t wait until the cake has pulled away from the sides of the pan to test for doneness: test it by pressing gently with a fingertip near the center. The cake should slowly spring back. (You can also insert a toothpick or cake tester near the center of the cake; it should come out clean, with no batter sticking to it.) Once you remove the cake from the oven, let it cool on a wire rack. Run a knife around the edges of the cake pan to loosen the cake, and invert the pan onto another rack or plate. Cool completely before slicing or frosting. This looks like the perfect dessert, great recipe!! I think I will try to double and bake in a Bundt pan, Slices easier and can serve more with smaller slices for those concerned with calories. Will serve with different choices of fruits or mixed berries.